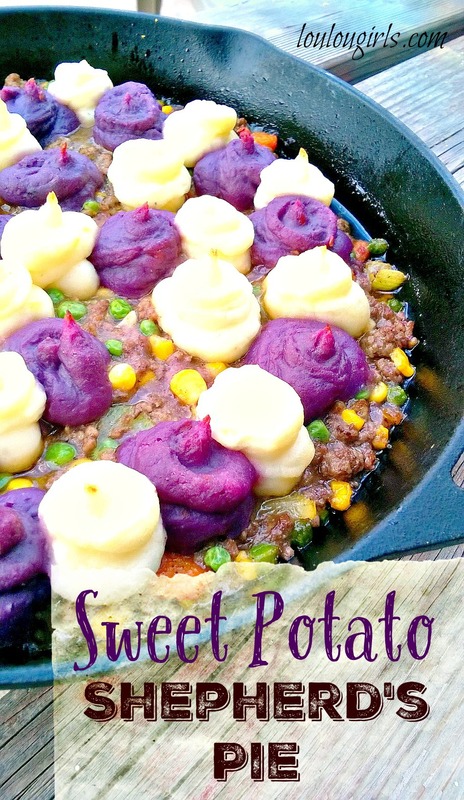 Have you ever tried purple sweet potatoes? I can tell you that this was my first go around. As I have told you in the past, my cute son Zac, is always looking and introducing me to new things so I can share them with you. He had baked some for his dinner with his wife and they thought they were amazing. To me they taste like a regular orange sweet potato but a little creamier. They aren’t easy to find but some grocery stores do carry them. The fun thing about this recipe is that you can try a new kind of sweet potato or you can use the regular orange ones that you are familiar with. 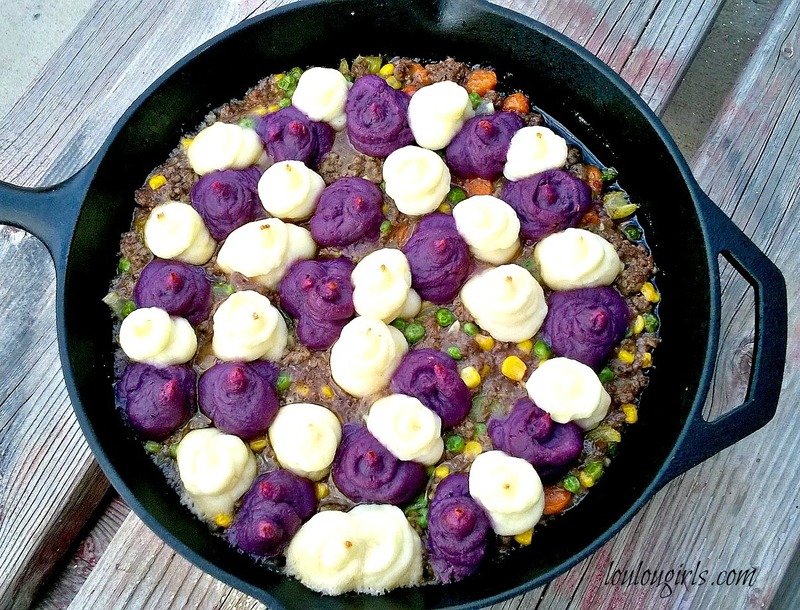 Most of us have tried a shepherd’s pie before but with the added sweet potato, it takes it to a new level of yumminess! In a bowl mash potatoes with a potato masher or mixer. Add all the other ingredients and mix well until combined. Set aside. Preheat the oven to 350 degrees. In a oven safe skillet, brown the ground beef. Drain the fat, and transfer beef to a bowl and set aside. Use the same pan as you used to cook the beef, heat the olive oil over a medium heat. Add the onions, and saute for a few minutes or until the onion begins to soften. Add the celery, and carrots to the skillet. Stir and then cover with a lid and allow to steam for about 5 minutes. Remove the lid,add the garlic and cook for additional 2 to 3 minutes, stirring occasionally. Add the peas and corn at this time. In a small bowl, combine the flour and 1/2 cup of the beef broth. Mix until there isn’t any lumps. Pour into the skillet and stirring for a few minutes. Add everything else to the skillet; cooked beef,the rest of the broth, tomato paste, rosemary, salt and pepper. Stir everything thoroughly and simmer for 8 to 10 minutes. Gently spoon mashed potatoes into a pastry bag and the same for the mashed sweet potato. If you don’t have a pastry bag, use a plastic ziploc bag with a small hole cut out of the corner. 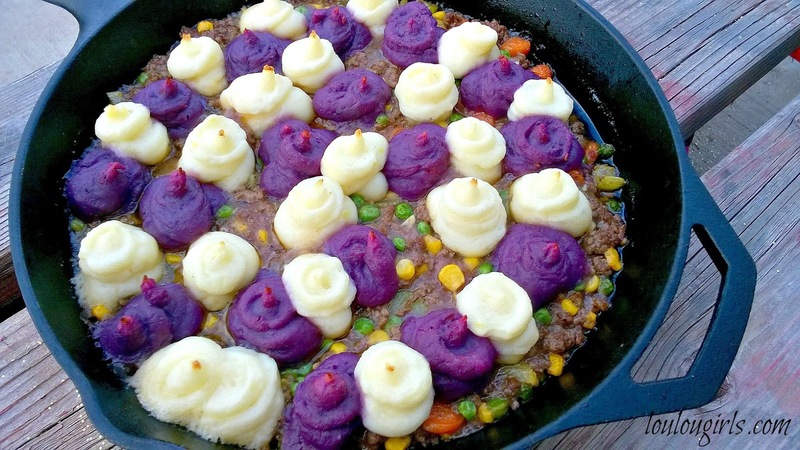 Pipe the potatoes into little puffs, alternating colors across the pie. Bake for 30 minutes or until the potatoes are lightly browned and the meat mixture is bubbly. Kimberly, I've never seen purple sweet potatoes! They look so cool. I love fun foods, this year we grew carrots that were yellow, red, purple, and white. They were so much fun to pull, you never knew what color you were going to get! Anyway, the Shepard's Pie looks really good, especially as the days are getting cooler, I'm craving comfort foods!